Now they're safe — and just got their first real baths. It's one thing to give up your pets, even after a lifetime of companionship and loyalty. But it's an entirely new level of cruelty to sell them into the meat industry. 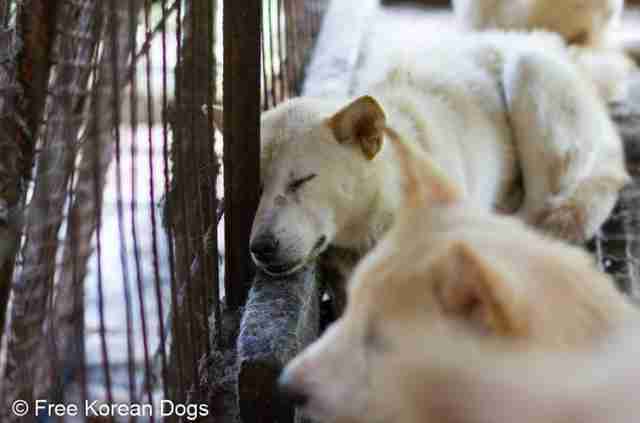 For Lilly and Pinch, a pair of dogs from South Korea, it must have seemed the ultimate betrayal. Their owners sold them to a local meat farm, trading in their lives as pets for those of livestock. Under the most harrowing conditions imaginable. "Every day is suffering on these farms because of the daily neglect they take," Kelly O'Meara, director of companion animals and engagement at the Humane Society International (HSI), tells The Dodo. "They're exposed to all the elements in barren metal cages. They get just enough food to get by. It's a pretty brutal environment." Fortunately for Lilly and Pinch, they didn't spend much more than a week in those cages. While the dog meat trade is legal in South Korea, this farm happened to be on land the operator didn't legally own. As a result, authorities, alongside local animal activists and members of HSI, were able to descend on the farm and free all 35 dogs. Not long after that, Lilly and Pinch were rinsed clean of their brutal history, in the most literal way possible. They were given a bath for the ages. Last week, 31 of those dogs, including Lilly and Pinch, flew to the U.S., where they ultimately ended up at a North Carolina shelter. From there, they will get the medical care and affection so long denied them, while learning to be dogs again - the kind who can be adopted to real, loving homes. Dogs never forget what it's like to be loved. "What we have found is that all of the dogs are just dogs," O'Meara says. "It doesn't matter what purpose they're raised for or where they come from." Even after going through the most traumatic experience, Lilly and Pinch just melted right back into the natural-born sweetness that is doghood. "They were very well-socialized," O'Meara says. "They're very sweet dogs." 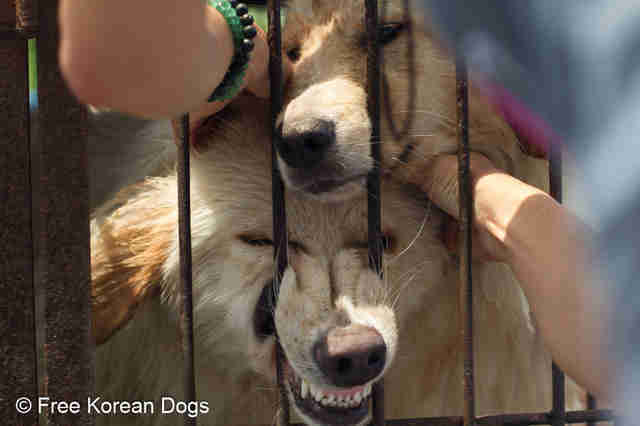 Since the HSI began fighting the dog meat trade in South Korea, the organization, with help from local animal rescue groups, has shut down five farms - sending around 525 dogs to the U.S. 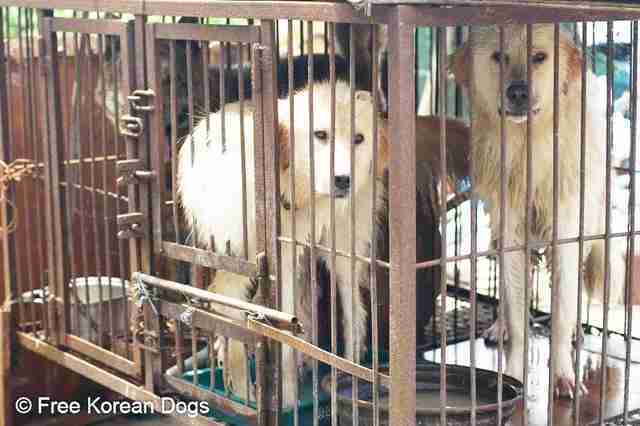 But anywhere from 2.5 to 3 million dogs are slaughtered every year in South Korea. Many of them are electrocuted, hung or beaten to death. 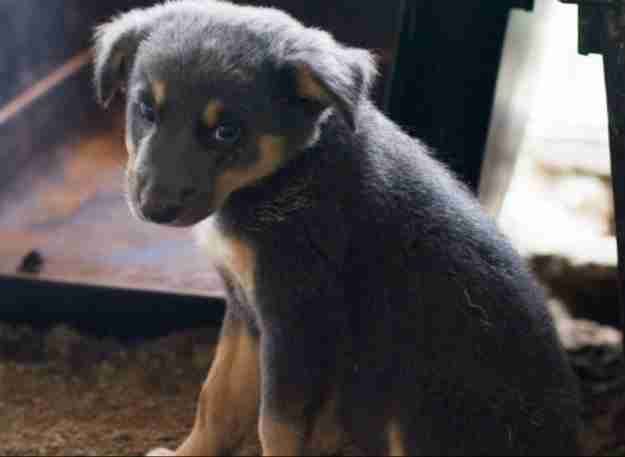 Many of these dogs are stolen from people's homes. Some, like Lilly and Pinch, are sold to dog traders willingly. But Lilly and Pinch will find new homes far from the brutalities of the dog trade. The kind of home where they can resume being dogs, not dinner, for the rest of their lives. 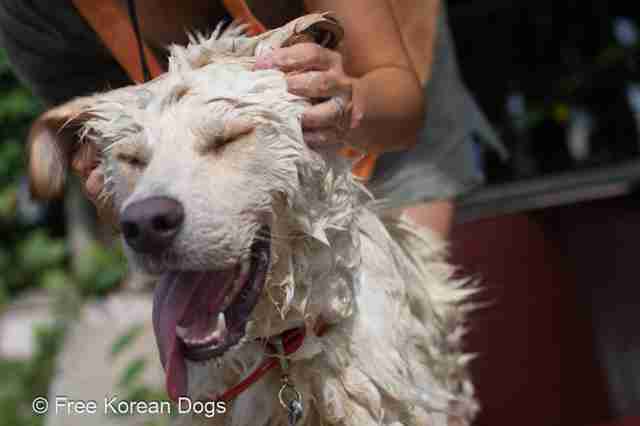 Want to support the HSI's mission to end the dog meat trade? You can also sign a petition here.